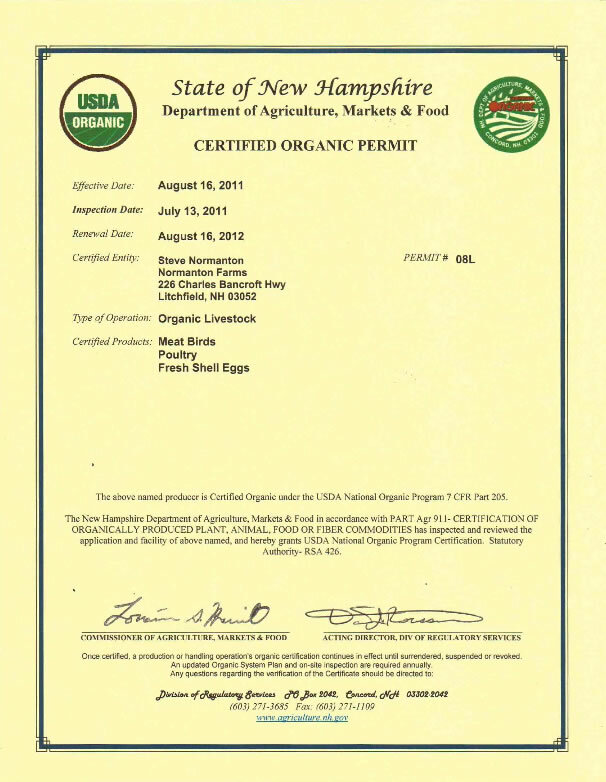 Our organic certification just got expanded! While our pastures have been certified organic for a long time, yesterday we also received certification for the meat chickens, the laying hens, and the eggs we produce on the farm. We have always raised all our livestock according to our personal standard of quality and conscience, which includes feeding only certified organic feed and never treating our animals with hormones or antibiotics. In the case of our chickens, our own protocol (plus certain record-keeping and paperwork) qualifies us for certification. Because we buy calves and piglets from suppliers that aren’t certified, our beef and pork do not qualify for certification. Rest assured, however, we hold our suppliers to our own high standard. For example, we buy calves only from suppliers who agree in writing to our protocol. Many farmers will tell you: don’t trust government labels. Instead, you should get to know your farmer, and find one you trust personally. We agree. But we also think the organic standards have a lot of merit. So we are proud of the extent to which we meet the standards, and we will continue to strive to do more. I am very Proud and Happy about you excellent Initiative! I would love to visit once ! Hooray! Congratulations our neighborhood farm! This is a wonderful honor you most certainly deserve. We, as customers and friends, truly appreciate your hard work and commitment in bringing the best to our community!